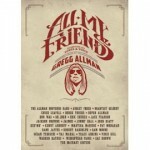 Share the post "Album review: ALL MY FRIENDS – Celebrating the Songs & Voice of Gregg Allman"
‘All My Friends – Celebrating the Songs & Voice of Gregg Allman’ is the sort of all star 26 track double album that the Americans do so well. It’s a multi-generational and all inclusive musical family that crosses over rock, blues and soul into country. So what’s not to like? Well sometimes a CD seems a poor cousin to a DVD and you could argue the CD lacks the intro’s and sense of occasion. Then again all those years ago, we all got fed up listening to those same sort of announcements on CSNY’s ‘Four Way Street’. You pays your money and you takes your chance! The highlights outnumber the lows, but there’s a whiff of never mind the quality feel the width, until the climactic end section of disc 2, which delivers everything that is essential about both Gregg and The Allman Brothers. The album ebbs and flows like all great concerts do, opening with the superb Warren Haynes whose vocals dominate both ‘Come and Go Blues’ and his pairing with Derek Trucks on ‘End of the Line’. He sets a high standard for a night that gathers an unstoppable momentum, in spite of both John Hiatt and Taj Mahall apparently being on auto pilot, while Brantley Gilbert’s thin vocals on ‘Before the Bullets Fly’ and Keb Mo’s croaked ‘Just Another Rider’ are no more than passable. On the upside, Devon Allman (now a valued member of Royal Southern Brotherhood) joins the outstanding vocalist Jimmy Hall, and Robert Randolph for a funky blues romp through Muddy Waters ‘You Can’t Lose What Ain’t Never Had’. Dr. John’s trademark vocals on ‘Let This Be a Lesson to Ya’ is minimalism at its best, while Train’s Pat Monahan revels on the soulful ballad ‘Queen of Hearts’. The possibly lesser known– well, to rock fans anyway – country star Trace Adkins is everything some other guests aren’t. He’s confident, expressive, authoritative and soulful, especially on ‘I’m No Angel’ and the rejigged Muddy Waters classic ‘Trouble No More’ (from the Allman’s self titled debut album). Disc 2 is stronger on the whole, with Vince Gill’s pedal steel-led ‘Multi-Colored Lady’ being both heartfelt and soulful, while Martina McBride soars on the title track, before she duets impressively with Pat Monahan on ‘Can You Fool’. Country star Eric Church also effortlessly crosses the country/rock divide on the slide led ‘Ain’t Wastin’ Time No More’, and he pushes himself to the limit on gospel reading of ‘Win Lose Or Draw’. Gregg Allman takes centre stage alongside Jackson Brown on the latter’s poignant ‘These Days’. It’s one of 6 tracks culled from Gregg’s ’73 ‘Laid Back’ album, of which a full ensemble version of ‘Will the Circle Be Unbroken’ later nicely rounds off the evening. ‘Melissa’ from ‘Eat A Peach’, extends the laid back mood and Gregg is joined by Vince Gill and Zac Brown for a beautifully arranged 3 part harmonies of ‘Midnight Rider’. From then on in, it’s the Allman Brothers all the way, with a mesmerising ‘Dreams’, full of intricately woven guitars and delicate percussion, and naturally enough the show stopping ‘Whipping Post’, on which the crowd heartily sing-along in between some spine-tingling guitar playing. This entry was posted in ALBUM REVIEWS, ALBUM REVIEWS (Mobile), All Posts and tagged album, All My Friends, Brantley Gilbert, Crosby Still Nash & Young, Derek Trucks, Devon Allman, Dr John, Eric Church, Gregg Allman, Jackson Brown, Jimmy Hall, John Hiatt, Keb Mo, Martina McBride, Muddy Waters, Pat Monahan, review, Robert Randolph, Royal Southern Brotherhood, Taj Mahall, The Allman Brothers, Trace Adkins, Train, Vince Gill, Warren Haynes, Zac Brown. Bookmark the permalink.